When you hear the Van Lier Nurseries name most members of the NZ Flower industry would assume we are going to talk about ROSES. In fact, they are one of the largest producers of fresh cut roses in New Zealand and have been doing so since 1967. That’s almost 50 years of NZ Grown flower production! This means that at some stage in your life, or in the life of your parents, or even in the life of THEIR parents, a Van Lier Nurseries grown flower will have been purchased and enjoyed through one of many NZ retailers. But that’s enough about roses, we are here to talk about Alstroemeria. Yep that’s right, this long standing family run business that are well known for their cut flower propagation and cultivation grow a myriad of different flowers throughout their nurseries in Massey and Riverhead, Auckland. 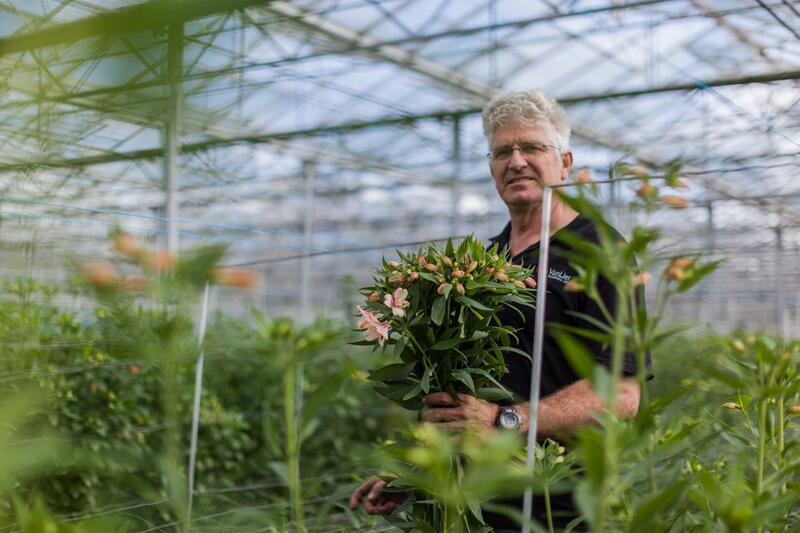 Their Alstromeria lines (while not as expansive as their roses) carry the same value and promise that all Van Lier products do: only the best quality makes it to market. Through a stringent quality control process, four main checks are done to ensure that only the best flowers leave their nurseries and make it out to the NZ consumer via flower retailers. Along with Florinca, they also grow standard Alstromeria in: Light Pink, Hot Pink, Orange, Cream, Red White, mauve, green, purple and yellow. Van Lier Nurseries have answered a few of our Grower Profile questions below. 1.When was your business founded? Our business story begins back in 1951 when Maria (Oma) and Walter (Opa) Van Lier immigrated to New Zealand from Holland arriving in Wellington on board the Zuiderkruis. They left Holland because of the housing shortage after World War 2 and to seek better opportunities for themselves and their future family. They founded Van Lier Nurseries in 1952 which became an incorporated company in 1967. 2.Have flowers always been your primary crop? Funnily enough, our first crop was potatoes! Oma and Opa purchased 2 acres in Glen Eden in 1952 where they grew & sold potatoes for 1 pound per sack. This was great money back then and enabled them to develop their horticulture business. Seeing the need for cultivated flowers, they started a NZ first and grew carnations. In 1974 they ventured into roses and we haven’t looked back since. Today we have 106,000 rose plants from which we commercially grow 48 different varieties of roses, including the famous David Austin’s. We also grow Florinca & Standard Alstroemeria, Spray & Standard Carnations, Parzival, Limonium, Gypsophila, Statice, Solidago, Helleborus and Zanzibar Gems. 3.Is it a family run business? If so who are the family members involved? Yes! Today Van Lier is a third generation family owned and operated business. The business is owned jointly by Theo Van Lier who is located at our Massey Branch and his son Harry Van Lier who is located at our Riverhead branch. We are very lucky to have had Steffan Van Lier come on board in March 2016. Stef works at our Massey Branch and is gifted with not only green fingers but great management and building skills! All of our Roses are grown under glass in our 14,000m2 of glasshouse in Riverhead. Our non-rose product is grown at our Massey site, under a mixture of glass and plastic. The glass house areas are controlled by environmental computers allowing us to monitor and control the environment, optimising growing conditions. The mediums they are grown in vary from crop to crop. For example Roses are grown on stands, in coco-fibre blocks which is predominantly made from Coconut husk, whilst our Alstro is grown straight in the ground in soil. 5.How to you pick/process your product lines? We pride ourselves on the quality of our product, so for this reason all of our product lines are picked daily to ensure they are picked at their optimum. In the height of summer, roses are picked up to three times a day (weekend included). We process all our flowers every day, using machines we have imported from Holland. We sort the flowers into first and second grade product –putting only first grade product onto the machine. The product is sorted into bays, based on their length. In each bay, they are sorted into the right amount of stems per bunch and bound together. From here we wrap them & sort them into orders or auction trolleys. 6.Tell us what you love about growing flowers for the NZ market. We love the idea every flower we produce is grown in New Zealand, by New Zealanders, arranged by New Zealand Florists and passed on to New Zealand citizens - keeping it local! 7.How many stems per season do you produce in each of your product lines? Over the last year, we have grown a staggering 1.4 million roses, 240,000 stems of Alstro and 200,000 stems of Carnations, just to name a few. 8.How do you keep up with the trends in the market? We are always testing and trialling new products and varieties that we think may be interesting to our customers and give us a point of difference from our competitors. We also closely follow trends happening within the worldwide floral industry, which includes visits to Europe and regular talks with overseas breeders. We are always trying to keep things interesting and on trend! 9.How many staff does it take to keep your business running? We have a total of 28 staff. This is made up of 23 full time workers and 5 part time workers staff spread over our two sites. We call ourselves the Van Lier family – we range in age greatly from 17 to 66 years old. Once we’re here, we often don’t leave – with many of us being here for over 20 years. 10.What makes NZ Grown Products superior to the rest? Everyone benefits from the freshest & highest quality blooms around. The flowers are picked, bunched and delivered to customers within a day - meaning fresh, long lasting, beautiful blooms. NZ’s bio- security regulations require that imported roses must be devitalized which is done by dipping the stem in round up. We are very pleased to say that our roses are completely carcinogenic free! As well as growing cut flowers, we also propagate plants for other cut flower growers around the country including Alstroemeria, Carnations, Gerberas, Roses, Statice,Limonium and Solidago. We import rose and carnation cutting material and make Mother Plants. From the Mother Plants we take small cuttings and use them to make new plants with.We also import tissue culture from a variety of breeders who have labs all around the world. The tissue culture is “hardened off” or “grown up” into plants over a period of 5 to 12 weeks depending on what type of flower it is. These plants are then used by growers around the country to create NZ Grown Flowers.